Have you ever wanted to visit a planet in another star system? While most of the known Kepler exoplanets are too far away to take a vacation, communicate with, or make atmospheric observations; a team led by Michaël Gillon just discovered 3 transiting Earth-sized planets (TRAPPIST-1b, c, and d) that are likely in the habitable zone of a very low mass M dwarf star just 40 light years away! That is only 15 light years further than the last group of aliens that contacted us. This prompts Emeline Bolmont et al., the authors of today’s featured paper, to investigate the likelihood that these planets – and other similar planets that orbit ultracool dwarfs – have any liquid water. Even though these planets are in the habitable zone today, they did not used to be. Since ultracool dwarfs cool down drastically in their early lives, the current locations of the TRAPPIST-1 planets were originally too hot to have liquid water, meaning any water on these planets would have been in gas form in the atmosphere where it would have been prone to escape into space. Bolmont et al. want to know: Is this type of planet capable of retaining its supply of water vapor for long enough to reach the period of time when the planet is in the habitable zone and its water can condense into the liquid form that is responsible for life on Earth? While most stars spend the vast majority of their lives on the main sequence where they get hotter and radiate more energy as they grow older, ultracool dwarfs spend a significant portion of their lives getting cooler and cooler. One type of ultracool dwarf – late M dwarfs like TRAPPIST-1 – have so little mass (0.08 solar masses) that they can take up to 100 million years just to reach the main sequence compared to 10 million years for a more massive star like the Sun. Meanwhile, the second type of ultracool dwarf – brown dwarfs – have so little mass (0.01 – 0.08 solar masses) that they never even reach the main sequence and technically, never become stars. When stars are not on the main sequence – where they fuse hydrogen – they have no energy source and emit less and less radiation over time. As this happens, the region around the star where a planet can harbor water and be considered habitable moves closer in towards the star. For brown dwarfs, this cooling slows down enough so that after about 30 million years, planets at 0.01 AU will spend about 100 million years in their system’s habitable zone. Meanwhile for late M dwarfs, this cooling stops when the star begins to fuse hydrogen and planets at 0.01 AU stay in their habitable zone for much longer than the lifetime of our solar system. Though, a planet at this distance would hardly be considered habitable if it had already lost too much of its water vapor when it was not in the habitable zone. 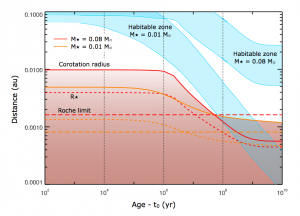 Habitable Zones around Ultracool Dwarfs over time. A planet at 0.01 AU around a late M dwarf enters its habitable zone (upper blue region) after about 200 Myr. A planet at 0.01 AU around a 0.01 solar mass brown dwarf enters its habitable zone (lower blue region) after about 3 Myr. The red region is too close to the star to have any surviving planets. For an Earth-sized planet in an ultracool dwarf system, radiation from the ultracool dwarf is the main source of energy driving the planet to lose some of its atmosphere. Specifically, the high-frequency (high-energy) X-ray and UV parts of the ultracool dwarf’s blackbody curve (XUV, for short) are the only parts of its spectrum that are energetic enough to cause the hydrogen and oxygen needed for water to escape. Fortunately, ultracool dwarfs are so cool that they hardly emit any radiation in the XUV (just 10 millionths of their total luminosity, according to recent observational measurements). Even though the TRAPPIST-1 planets are 20 to 100 times closer to their star than Earth, they receive no more than 4 times the amount of XUV radiation as the Earth does, which is promising for the planets’ prospects for retaining water. The second factor affecting water loss is the ratio of hydrogen that escapes compared to oxygen. Ideally, hydrogen — which can be photo-dissociated by the incident XUV radiation — will escape at a 2:1 ratio to oxygen, so that there will be the same 2:1 ratio left for it to easily recombine into water later on. However, Bolmont et al. calculate that with the amount of XUV radiation, a slightly less favorable 4:1 is a more realistic loss ratio (since hydrogen is much lighter than oxygen). They then use both the 2:1 and 4:1 ratios to calculate how many “Earth Ocean’s worth” of water vapor are lost in the atmospheres of 0.1, 1.0, and 5.0 Earth mass planets around different mass ultracool dwarfs. Water loss for different mass planets (circles, squares, and triangles) around different mass brown dwarfs. The left panel uses a 2:1 H:O loss ratio. The right panel uses a less favorable 4:1 ratio. The red points assume the XUV radiation is 10 millionths of the total. The blue points assume a smaller constant value. As expected, lower mass planets around higher mass brown dwarfs lose more water. Can any of the TRAPPIST-1 planets have water? Bolmont et al. find that the two innermost planets – TRAPPIST-1b and 1c – likely would lose more than an “Earth Ocean” of water vapor in their early lives, making it unlikely for them to have any liquid water left today. 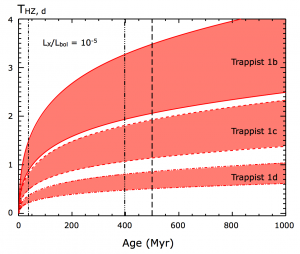 On the other hand, TRAPPIST-1d is much more likely to retain a significant fraction of its water vapor, making it the best candidate of the three to have any water and an excellent target in the search for bio-signatures outside of our solar system. The amount of water loss (in Earth Oceans) on each of the 3 planets over time. If a planet only started with 1 Earth Ocean of water, once it loses 1 Earth Oceans of water, it will not have any more water. The left dashed line at about 40 Myr is the time when TRAPPIST-1d enters the habitable zone. The right two dashed lines at 400 and 500 Myr are age estimates for the system. At its current age, only TRAPPIST-1d has lost less than 1 Earth Ocean of water. The authors caution (positively!) that they are probably overestimating the amount of water loss for these types of planets. If they started out with more than an Earth Ocean of water, they could still retain some even with the large loss. 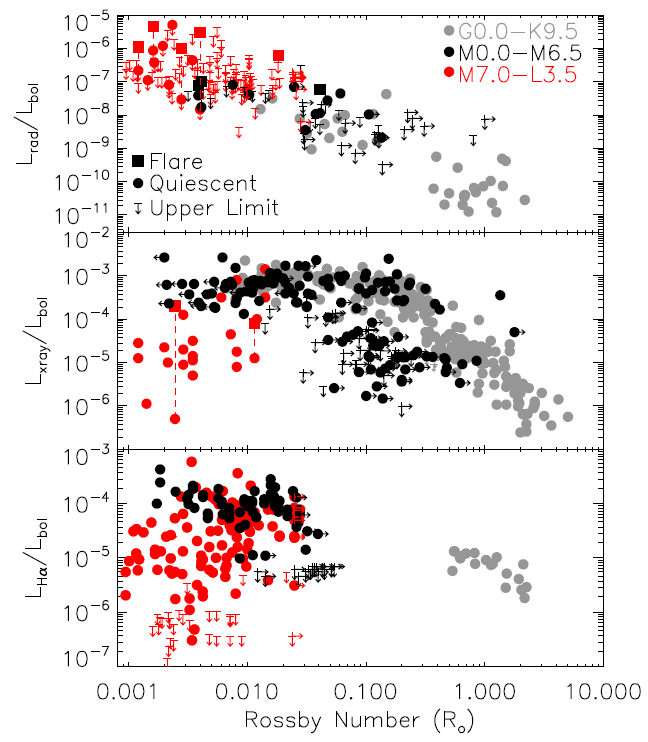 Additionally, the amount of XUV radiation emitted by ultracool dwarfs is poorly constrained and its un-detectability in most systems makes it likely that it is even less than the measured values used in this study. Both of these factors, along with several others, would only improve the chances that these planets have water. Bolmont et al. hope that the soon-to-be-launched James Webb Space Telescope (JWST) will be able to measure the atmospheric composition of the TRAPPIST-1 planets. They can then use these measurements to see if they are underestimating or overestimating the amount of water vapor in the atmosphere at the present time. If JWST can support these models, it would be a great sign for future studies of their habitability.